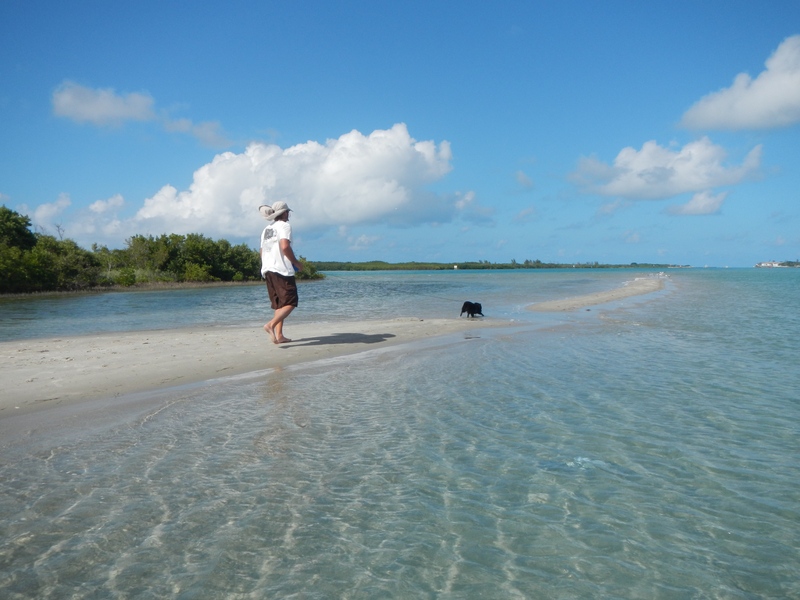 We finally broke away and motored down the ICW to Fort Pierce on Tuesday. The wind was on the nose of course so the sails have yet to see daylight on this trip. Besides gawking at atrociously large mansions we watched the parade of cruising boats, one after another, heading north. All the boats are heading north. We didn’t run into one other southbound boat for the day. Hmmm… Something about that hurricane season thing. We busied ourselves noting how high each boat’s davits held the dinghy out of the water, which boats had super comfy captains chairs in the cockpit, and how much stuff was lashed across the decks and off the sterns. Lots of fun boat watching making it an enjoyable and easy day. Thinking the day was pretty much done, we took Kai to a spoil island and let him run free and were settling in for an afternoon nap in the cockpit (to even out the morning nap in the cockpit) when all the northbound boats having taken the weather window from the Bahamas started piling into the anchorage. More boat watching! We even got to see one really close-up and personal as it tried to put their anchor right on top of ours. We let little Kai bark his non-existing tail off. Note: we usually discourage his barking-please don’t leave me hate mail, in this case it was warranted. The other boat figured out on their own as they started paying out the scope that they were going to end up with our bow up their stern and moved along and Kai calmed down. Several boats later, a boat that I recognized immediately poked their way into the anchorage. We met them three years ago in Double Breasted (Bahamas). They had graciously invited us aboard and shared stories of their years of cruising adventures. We were enamored with them and that one evening was a very defining moment in our cruising plans. This couple was in their seventies and spending their days diving and catching their dinner everyday. They were relaxed, welcoming people just loving each day. I wanted to be them when I grew up. Their stories of the San Blas islands of Panama were one of the factors that led us from a one-year plan to a multi-year plan. But little details of their boat also stuck with us too. I made little beanbags for the cockpit and planted the herb pot, just like our idol boat. While we spent time together with them in the Bahamas they printed off weather from the SSB as TS Beryl developed over our heads. We knew immediately that we wanted to be able to do that ourselves! Keith liked their dinghy and motor set up. They gave us a glimpse into and inspiration for what we hope to do ourselves. How fitting to run into them again at the very start of our journey. While we tried patiently to give them time to anchor and settle in before we bombarded them with enthusiastic hellos, we dinghied around the anchorage and watched yet another familiar boat weave its way in. One from our Marina-same pier even! So after spending some time chatting and reconnecting with our idols (they remembered us! ), we made our way over to our neighbors boat where he filled us in on all the latest Bahama related scoop. Best laundry and provisioning, dive and shelling spots, good anchorages and the cellphone/data setup. He even very generously gifted us a Bahama phone he wasn’t using anymore after hearing that we were not planning on getting phones at all. Sweet-maybe I will be able to keep these posts coming more regularly after all! We may not have left the country yet, but we are getting into the cruising vibe. I like it. Thanks-clear, blue water pics are coming!